Another weekday, another 2 movies, starting with the Bill Hader/Kristen Wiig dramedy THE SKELETON TWINS. Lest you think this teaming of SNL stars means it's a wacky screwball comedy, it opens with Milo (Hader) slitting his wrists in the bathtub. Maggie (Wiig) learns about it as she's about to swallow a handful of pills. Lest you think it's unending bleakness, there are some genuinely hilarious scenes (without giving too much away, the dentist's office and the lip-syncing scenes are standouts.) Twins Milo and Maggie used to be very close, but Milo's suicide attempt gets them talking together for the first time in years. Maggie has a perfect life facade--a good job as a dental hygienist, a hunky husband (Luke Wilson, at his pleasantly bro-tastic best,) and scuba lessons. But you've probably already guessed that it's just a facade (wait, you didn't have to guess, I told you.) Meanwhile Milo had moved to Los Angeles to become an actor but instead became a sad, gay cliche (oh yeah, he's gay.) It's a great story and great character study about life not working out as you expected (or hoped) and how those closest to you help you out the most but also have the ability to hurt you the most. And how close siblings are, even if you haven't talked in a long time. Both Hader and Wiig were there for the Q and A, so of course it was hilarious. Hader was the "on" one with Wiig playing a reacting role, but they were both great. 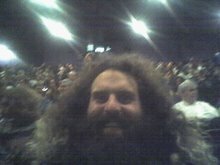 In fact, I stayed a little too long at the Q and A and just missed out on the last press ticket for KUMIKO, THE TREASURE HUNTER (I was literally seconds behind the guy who got the last one.) No problem, I have two more chances but that kind of throws my whole weekend around. Instead I got a ticket for BAD HAIR, which turned out to be a good choice. Junior is ten years old, lives in a low-rent high rise in Caracas, and desperately wants to straighten his curly hair so he can look like the models and singers on TV. Although I'm a proud owner of a rather impressive curly head of hair, I don't see anything too wrong with his wish. But his mom does--she sees it as a sign of femininity. And she starts seeing other signs...like sitting down to pee. Or just generally not being interested in playing soldier. Which is ironic, because she's kind of tough as nails, and a great mother. But fears and mis-communication conspire to put a lot of strain on their relationship. Seeing it mostly from the kids point of view (where wanting to play straight-haired singer instead of solider is nothing bad) it's fun getting into that feeling of being perplexed at his mother's consternation. A mark of a good movie is when it lets you figure things out for yourself, and BAD HAIR specifically lets you figure things out exactly the way the 10 year old Junior does.